S Mohana, N Seethalekshmy, K Pavithran. Splenic Cystic lymphangiomatosis presenting with massive splenomegaly. The Internet Journal of Pathology. 2008 Volume 8 Number 1. Cystic lymphangiomatosis of the spleen is an extremely rare pathologic entity. It is considered to be the result of a developmental malformation of the lymphatic system and can involve the spleen alone or may be a part of multiorgan disease. It is usually seen in children. We report a case of cystic lymphangiomatosis of the spleen occurring in an elderly woman presenting with massive splenomegaly with emphasis on the rarity of the case in old age and on the problems in the differential diagnosis. Lymphangiomas are benign lymphatic system malformation of obscure aetiology. It can be either solitary or multiple. They principally occur in children or young adults and are rarely seen in the elderly. The most common locations of lymphangiomas are the neck and the axillary region1. Cystic lymphagiomatosis of the spleen is a very rare entity and is usually solitary and asymptomatic. We report 51 year old woman who presented with massive splenomegaly which turned out to be cystic lymphangiomatosis. Even though rare, cystic lymphangiomatosis should be considered in the differential diagnosis of multiple focal lesions of the spleen even among elderly. A 51 year–old woman presented to us with history of vague pain in the left side of the abdomen. There was no fever, dyspepsia or weight loss. Physical examination showed no pallor or lympadenopathy. Spleen was grossly enlarged- 20 cms below the costal margin. Initial diagnostic possibilities considered were myelofibrosis or low grade lymphoma. Complete haemogram results were within normal limits. Bone marrow aspirate and biopsy was normal. Ultrasonography and CT scan of the abdomen showed splenomegaly with focal lesions which were highly suggestive of lymphoma or granulomatous disease. As a diagnostic as well as therapeutic option she underwent elective splenectomy without any complications. Spleen on gross pathologic examination was measuring 18 x 13 x 6 cms and weighing 700grams. On cut section it showed multiloculated cysts replacing the entire splenic parenchyma. These cysts were of varying sizes ranging from 0.1 cm to 2.5 cms in diameter (Figure.1). 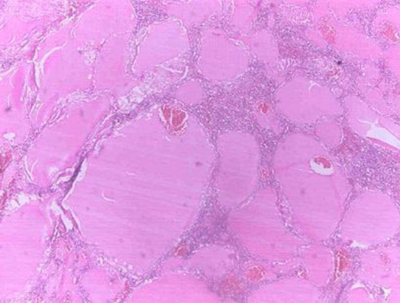 Histologically, multiple cystic spaces lined by flat endothelial cells were seen (Figure.2). On immunohistochemistry the cells were found to be positive for CD 31 and negative for AE1/AE3 (pan cytokeratin); confirming the endothelial nature. Lymphangiomatosis is a rare, sporadic disorder characterized by cystic lymphangiomas involving multiple organs23. The most common sites involved are skin of the face, neck and the axillary region. Involvement of visceral organs like kidney, bones, liver and soft tissues are extremely rare. When multiple organs are involved it is termed as systemic cystic lymphangiomatosis2. In contrast to single lymphangiomas, this form has been reported to be progressive and to have poor prognosis4. The cystic cavities vary in size, from microscopic to several centimetres in diameter3. The formation of cystic lymphangiomas is thought to be due to sequestration or obstruction of lymphatic vessels during embryogenesis. The exact cause is unknown. Lymphangiomas of the spleen are rare and can present as a solitary nodules, multiple nodules or diffuse growth. More often they consist of multiple cysts of varying sizes lined by flat endothelial cells, which contain eosinophilic serous fluid. The septations are made of fibrous connective tissue with rare vessels5. Clinically, the disorder can be classified as systemic, hepatosplenic, or purely splenic or hepatic. Lymphangiomatosis with isolated involvement of the spleen is very rare678. It is seen equally among both sexes. It has been described to occur from birth to the seventh decade of life; however, isolated solid organ involvement seems to occur in patients older than 25 years of age. Initial symptoms are usually due to the mass effect caused by the enlarged organs. At ultrasonography the cysts are hypoechoic with internal debris. The septa are hyperechoic and may show detectable vasculature at colour doppler study6. If the cystic spaces are small and below the resolution of the ultrasound technique, then portions of the mass may appear hyperechoic due to the existence of numerous reflecting interfaces. This may erroneously lead to misdiagnosis of lymphoma as in our case. The differential diagnosis of cystic lymphangiomatosis includes true splenic cysts, mesothelial cysts, echinococcosis and very rarely cystic hamartoma1. True splenic cysts will have definite epithelial lining. They may present with septations but usually the multicystic cavities are larger than in our case. Parasitic cysts most commonly due to Ecchinococcus granulosus may be indistinguishable from any other multicystic mass; therefore they may resemble cystic lymphangiomatosis. Any patient with a cystic splenic mass should have a serologic test for echinococcosis. Cystic hamartomas are very rare in the spleen, and occur more frequently in the liver in the paediatric age group7. Although cystic lymphangiomatosis of spleen is a benign entity, one case of malignant lymphangioma was also reported9. The malignant degeneration was suggested by the increased proportion of solid areas as in ovarian epithelial neoplasms. In their patient, the endothelial cells had formed papillary excrescences within some of the cystic spaces, and solid foci in other regions of the mass. The normal evolution of splenic lymphangioma is variable. Small lesions are often incidentally detected. Larger lesions may increase in size and cause the compression of other organs or rupture even after minor trauma. Treatment typically consists of fenestration of large cysts or surgical resection of cystic organs. For larger splenic cysts, splenectomy is advantageous, as the risk of rupture is very high8. Splenectomy tends to result in relief of symptoms and in resolution of anaemia and thrombocytopenia in patients with hypersplenism. Cystic lymphangiomatosis of the spleen, even though rare, should be considered in the differential diagnosis of massive splenomegaly even among the elderly as it is a fully treatable disorder. 1. Anadol AZ, Oguz M, Bayramoglu H, Edali MN. 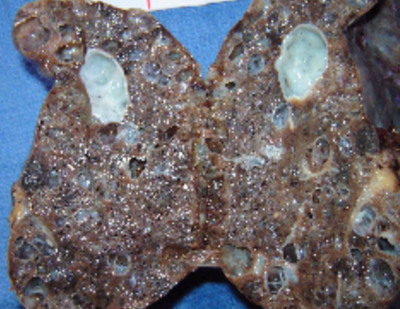 Cystic lymphangioma of the spleen mimicking hydatid disease. J Clin Gastroenterol 1998; 26:309-311. 4. Asch MJ, Cohen AH and Moore T. Hepatic and splenic lymphangiomatosis with skeletal involvement: report of a case and review of the literature. Surgery 1974; 76:334-339. 6. Komatsuda T, Ishida H, Konno K, Hamashima Y, Naganuma H, Sato M, Ishida J and Masamune O. Splenic lymphangioma: US and CT diagnosis and clinical manifestations. Abdom Imaging 1999; 24:414-417. 7. Ros PR, Goodman ZD, Ishak KG, Dachman AH, Olmsted WW, Hartman DS and Lichtenstein JE. Mesenchymal hamartoma of the liver: radiologic – pathologic correlation. Radiology 1986; 158: 619-624. 8. Morgenstern L, Bello JM, Fisher BL and Verham RP. The clinical spectrum of lymphangiomas and lymphangiomatosis of the spleen. Am Surg 1992; 58:599-604. 9. Feigenberg Z, Wysenbeek A and Avidor E. Malignant lymphangioma of the spleen. Isr J Med Sci 1983;19:202-204.